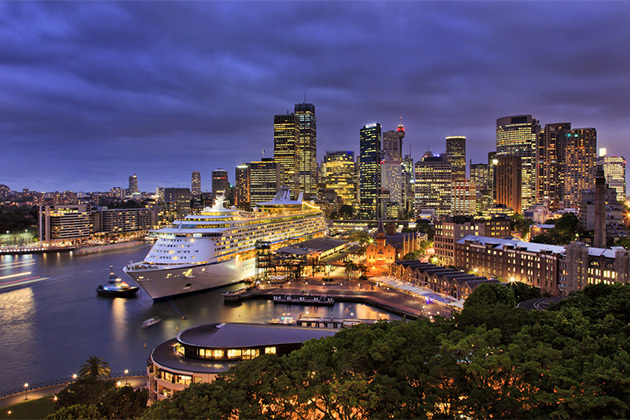 Australia is regularly voted one of the world's top cruise destinations. Why? Some say it's the endless summer weather or the oversupply of beaches and the eye-candy that goes with it, while those with more mature visions suggest it could be Sydney's scenic, natural harbor and iconic landmarks, including the opera house and Harbour Bridge. Australia is also much more than just Sydney. Coastal cruises visit the other major port cities and open up opportunities to venture inland to wineries, national parks, tourist attractions and shopping precincts. Beyond the urban sprawl, there are vast mountain ranges, UNESCO World Heritage natural and historic sites, cultural and Indigenous attractions and a world of fun for both adrenaline seekers and those who prefer a more relaxed or cultural experience. It is quite feasible to begin or end a cruise at most Australia ports, extending your vacation with a land tour extension. Let's face it: Australia is a long way to travel for most folks, so why not make full use of your time Down Under and add on an outback tour to Uluru or Alice Springs? Australia is a year-round cruise destination, although the so-called "Wave Season" (October to April) is when Aussies go particularly cruise-crazy, and you'll find the greatest choice of departures, vessels and itineraries. While winters (June to August) in the southern states can be chilly, you won't need snow shoes or thermal undies. Summers (December through February) can be hot -- darned hot -- so if you're visiting over the Christmas period, be prepared with wide-brimmed hats, sunscreen and water bottles for those days when temperatures get into the 30s Celsius (high 80s and 90s Fahrenheit). The official Australian cyclone season begins on November 1 and ends on April 30, with the highest risk of a major storm falling between March and April, although they tend not to interfere with cruise schedules too often. Summer is also a standard major annual holiday period for families, so expect crowds around major attractions and in some destinations -- particularly beach resorts. Just about every cruise line on the planet visits Australia at one time or another these days, with major lines homeporting ships there. P&O is the local mainstream cruise line, catering to Australians with cruises from a growing number of ports like Sydney, Brisbane, Melbourne and Fremantle (Perth). In recent years, it has been joined by fellow Carnival Corp. brands like Carnival,Cunard Holland America.Seabourn, also operates four ships at a time in the region during the continent's summer months. Royal Caribbean and Celebrity have been major players Down Under in recent years, too, with both lines basing vessels in Australia since 2013. Embarkation ports include Sydney and Brisbane. Australians have an additional passion for small-ship and adventure cruising, with domestic brands --Coral Expeditions, North Star and Captain Cook- regularly visiting remote regions like the Great Barrier Reef, the Kimberley (in the country's far northwest), Cape York and the Top End. These lines also cruise to, and within, nearby destinations like Papua New Guinea, Indonesia and the Melanesian Islands. Lindblad has based National Geographic Orionin the region. Most Australia cruises focus on destinations that include Noumea (New Caledonia), Port Vila (Vanuatu), Port Denarau (Fiji) or Auckland (New Zealand) with a few occasionally venturing as far as Apia (Samoa), Nuku'alofa (Tonga), Honolulu (Hawaii) and Papeete (Tahiti). Of the cruises that don't visit international ports, most head north toward the endless sunshine and sand of Queensland, visiting Newcastle, Brisbane, Cairns, and Moreton Island, with some itineraries including a host of evolving destinations like Mooloolaba on Queensland's Sunshine Coast, the Whitsundays and both Port Douglas and Cooktown in far north Queensland. Sydney offers most of the departures, but Melbourne, Brisbane, Adelaide and increasingly Fremantle (Perth) also feature local stalwart P&O, its ships venturing down to Tasmania and across to South Australia. For locals, the choice of both vessel and destination is expanding rapidly. 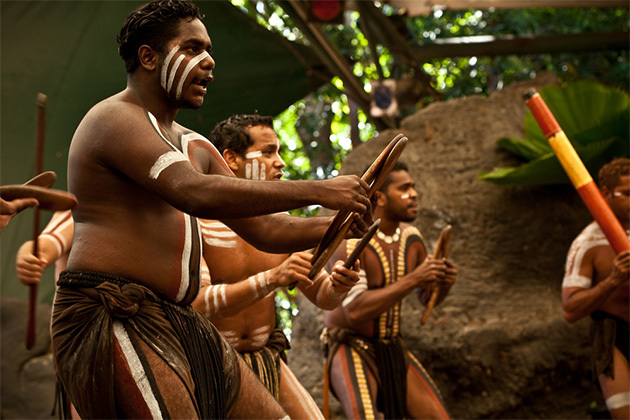 For visitors, cruising in Australia presents three basic options: to, from and within. 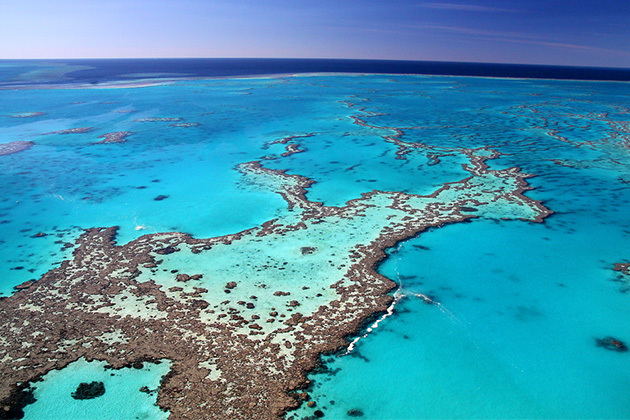 The Great Barrier Reef: Cruises through the world-famous coral reef are popular, but if you want a true "Finding Nemo" experience, you'll need to spend a bit more time ashore at ports like Townsville or Cairns. Big-ship cruises along the Queensland coast will offer daytrip opportunities for reef-snorkeling and diving, but small-ship operator Coral Princess offers the most immersive overnight experience. Circumnavigation of Australia: In recent years, Princess, Holland America and Cunard have offered complete circumnavigations. These sell out well in advance, however, as they present a superb opportunity to see every port in the country, and they're popular with local cruisers. Kimberley and Australia's Northwest: This spectacular part of the country is no longer a secret. Big ships will swing by as part of a circumnavigation, but for a comprehensive exploration, you'll need to get aboard one of the expedition vessels, such as North Star Cruises' True North. Rest of Australia and Tasmania: Itineraries have been developed to incorporate a growing number of ports of call in Tasmania, Victoria and South Australia seasonally. Popular destinations include Burnie, Hobart, Port Arthur, Melbourne, the Mornington Peninsula, Portland, Adelaide, Kangaroo Island and Port Lincoln. South of Sydney, near the border with Victoria, Eden is also a new port of call that appears occasionally on itineraries, while in Western Australia, itineraries from Fremantle (Perth) venture south to scenic Margaret River or Esperance, or north to Geraldton, Exmouth and tropical Broome. The South Pacific: One of the most popular local choices is a cruise to or from an Australian homeport to the islands of the South Pacific. Departures are mostly from Sydney but also increasingly from Brisbane and Melbourne. Traditionally, the well-worn route pioneered by P&O across the Tasman to the South Pacific included Fiji, Noumea, Auckland and Port Vila, but it has been expanded to include all of New Zealand, more of Vanuatu and New Caledonia and some of Samoa and Tonga, with occasional forays as far as French Polynesia and Hawaii. Expedition and Small-Ship Options: With Australia's vast coastline, there are numerous operators offering small-ship explorations to such locations as the Kimberley, Cape York, Top End and Murray River. Premium pricing and limited capacity keep numbers low, but the demand continues to grow, with increasing numbers of more adventurous or "been there, seen that" foreign visitors opting for these exclusive itineraries. New Zealand: Most local cruise lines cross the Tasman to New Zealand each summer, including P&O, Holland America, Cunard, Celebrity and Princess. Itinerary options include shorter one-way trips from Sydney or Melbourne to Auckland, or the reverse, or longer roundtrip cruises that also take in the spectacular Fiordland on the South Island. Papua New Guinea: For big-ship fans, P&O's return to Papua New Guinea in 2013 was a nostalgic destination for the 175-year-old line. For those wanting a more intimate "small footprint" experience, Lindblad, Coral Princess and North Star all deliver exceptional expedition products. Sydney Australia. This historic and beautiful port was first settled by British convicts and their overseers in 1788 after identification by Captain Cook as a possible safe anchorage 10 years prior. As such, the downtown precinct immediately around the Overseas Passenger Terminal in The Rocks makes for a fascinating exploration, easily done independently on foot. 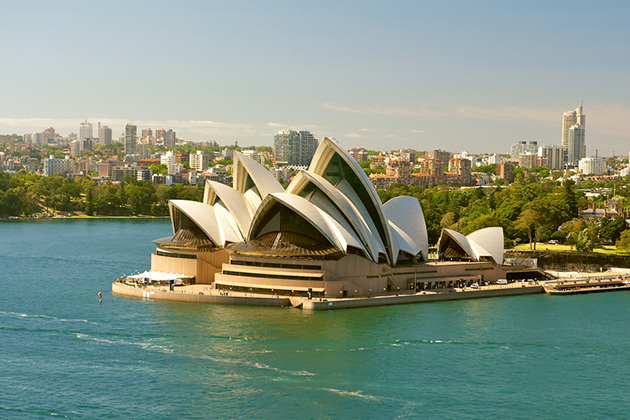 Stroll across the Harbour Bridge (or climb it), visit the opera house, meander through the gorgeous botanic gardens or, if time permits, take an inexpensive ferry down the harbor to Manly. Major department stores, swanky restaurants, quaint pubs and designer shops are a just a stone's throw away. Beyond the immediate port district and city, organized (full-day) shore tours can take you as far as the scenic UNESCO-listed Blue Mountains or even the famous 4,000-acre Hunter Valley wine district for some "tipple and tucker." Melbourne Australia. Australia's second-most populous city is proud of its non-convict heritage and therefore conducts itself with an air of cultural superiority -- or at least that's what Sydneysiders say. Its proud sporting history includes the vast Melbourne Cricket Ground (MCG) and the picturesque Albert Park Grand Prix circuit. Much urban renewal has taken place around the port area, but many of the historic buildings have been preserved and converted for commercial and retail use. A guided or self-guided walk around Flinders Street and Federation Square reveals a quirky, semisecret underground of cool boutiques, cafes, vintage shops and backstreet chic. Away from Melbourne, day-tours are typically offered to Phillip Island, where the delightful Fairy Penguins will entertain you, or to the natural beauty of the Yarra Valley, Mornington Peninsula or Dandenong Ranges. There is a wealth of gastronomic and winery options at many of these destinations. 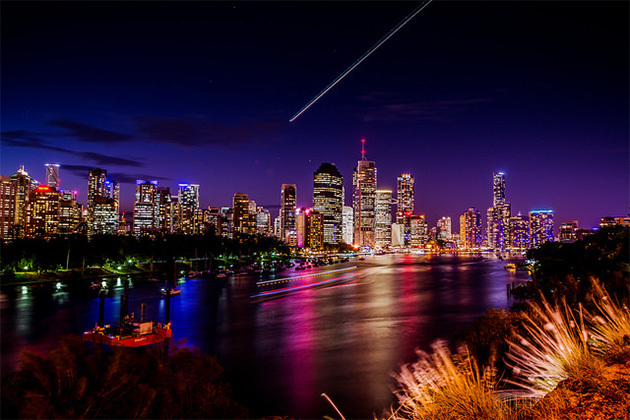 Brisbane Australia Playfully christened "BrisVegas" by locals and visitors alike, the most northern of the eastern seaboard capitals enjoys a reputation for lively nightlife in a semitropical environment. While all-day and half-day city tours around Brisbane will keep most cruisers busy, there is an option for longer trips to Steve Irwin's famous Australia Zoo or one of the exciting theme parks along the Gold Coast. Natural attractions like Mt. Tamborine and the rainforests of the Canungra Valley are also on offer. Adelaide Australia Described by its larger sibling cities as "a big country town," this city of arts certainly has a more relaxed semirural atmosphere. The port often plays host to vessels transiting between the east and west coasts. Remote Outer Harbour requires a train, bus or taxi to deliver visitors to the city center, where expansive parks, gardens, museums and art galleries await exploration. Outside the city, daytrips are easily made to the famous wine districts of the Barossa Valley and McLaren Vale. Fremantle (Perth) Australia Although it's the port access for Perth, Fremantle has embraced its maritime roots and become a destination in itself, with a pair of superb museums and several quirky pubs and shopping areas to cater to cruise visitors. If you want to get out of Fremantle, tours to Perth can take you to Kings Park, the Zoo, the famous Perth Mint or into the glorious Swan Valley for a "foodie frolic" at the area's wineries, restaurants, breweries and distilleries, as well as local markets. Never swum with wild dolphins? You can do that there, too. Cairns Australia. Dubbed the "gateway to North Queensland," Cairns is a key hub for visitors wishing to explore the Great Barrier Reef and the region's ancient Daintree Rainforest, including Kuranda. The city itself is like a big, easygoing, oversized tropical village with a reputation as a backpacker haven. Yet, over the years, it has evolved into a sophisticated city with attractions beyond its natural resources. Besides quaint cafes and top-class restaurants, it's also good for duty-free shopping. Darwin AustraliaThis is another major gateway city, largely to the Top End's spectacular national wildlife parks. It also has a well-earned reputation as a hard-partying town, with a distinctly outback attitude to life, although in recent years all that's changed. Today's Darwin is a foodie haven and a genuine multicultural city. Although it lacks sightseeing opportunities beyond the national parks outside of town, a visit to one of its many lively and colorful markets is a great way to get to the heart and soul of the place. Hobart Australia. Tasmania's capital is becoming an increasingly popular port of call on many Australian itineraries -- for good reason. A small city set on a beautiful harbor with the imposing Mount Wellington as a dramatic backdrop, it's a combination of beautiful architecture and scenery with a strong colonial heritage. In the early 1800s, Tasmania was settled as a British penal colony when it was known as Van Diemen's Land, and today, fortunately for visitors, much of the original architecture from that period remains intact. Other cities currently welcoming large cruise ships are Townsville, the country town on the coast offering access to the Great Barrier Reef; the historic town of Newcastle and the Whitsundays, famous for tiny islands and pristine beaches. Planning time ashore. Australia is such a vast and multifaceted land that a land-based stay either before or after your cruise is a must. Get to the Outback if you can, as it's a whole different world. Maximize your time on the ground by traveling between cities by air. Consider the economical Qantas Walkabout Air Pass for flexibility and value, or book budget flights with Jetstar, Virgin Australia and new player, Tiger. Full-day shore excursion. Unless you are on a very tight turnaround, take shore excursions in capital cities when you can. For example, visit the Blue Mountains or Hunter Valley from Sydney or the Yarra Valley from Melbourne. Private operators are available if you research ahead. Duty-free shopping. The shopping aboard Aussie cruise ships is excellent, whereas airports and city stores are not the best places to find deals. Day-cruise. If you're longing for an immersive experience on the famous Great Barrier Reef, the larger cruise lines are not fully set up to deliver this in a way to do it justice. Day-cruises out of Cairns or Townsville are better options, or book yourself onto one of Australia's small-ship operators like Coral Princess Cruises, which offers comfortable live-aboard itineraries for snorkelers and divers. Tourist entry into Australia. Most European passport holders will need to obtain a free eVisitor visa, while visitors from the United States and Canada will need an Electronic Travel Authority (ETA), both of which can be applied for online. The eVisa allows for a stay of up to three months at a time within a 12-month period, while the ETA allows you to visit as many times as you wish for up to 12 months and stay up to three months each visit. For visa information, go to the Australian Government's Visa Wizard website. Note that most passengers taking cruises of up to 30 days that leave from and return to Australia are "round trippers," meaning that, for immigration purposes, you have not left the country.